South-East leaders on Friday spoke gloriously of the remarkable achievements of the All Progressives Congress (APC) in the country. They praised the ruling party for delivering good governance, ensuring respect for individual liberties, instituting accountability and paving way for economic development. The leaders who were in Onitsha to drum support for Anambra State APC governorship candidate, Dr. Tony Nwoye described the Muhammadu Buhari led APC government as the most purposeful and resolute in the history of Nigeria. They commended APC National Chairman, Chief John Odigie-Oyegun for focusing on the growth and stability of the ruling party. The leaders also described the so-called biggest party in Africa as a symbol of oppression, corruption and injustice. They said that the APC had remained an indivisible entity. “The APC is consistent about its political aims and objectives. It is organizationally propelled by strict discipline, ideologically inspired by the highest human ideals and a sense of solidarity and socially motivated by unity of purpose and love of fatherland” the leaders said. Chairman of South-East Advancement and Unity Forum, Chief Maxwell Okoye said the ruling party had taken the right path towards reviving the economy. 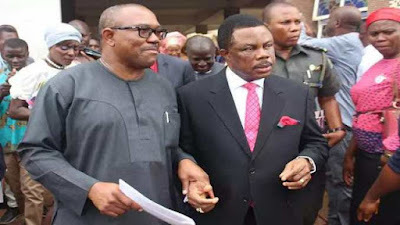 Okoye who spoke in Igbo told the mammoth crowd at the venue of the Anambra State APC governorship flag-off that it was high time Anambra State joins the mainstream of Nigerian politics. He praised the ruling party for putting the country back on the path of self-reliance and sustainable growth.